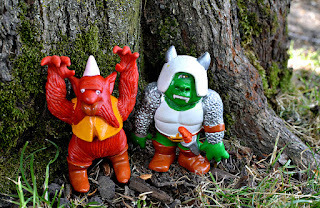 Little Weirdos: Mini figures and other monster toys: Blackstar companion figures: demon minions! 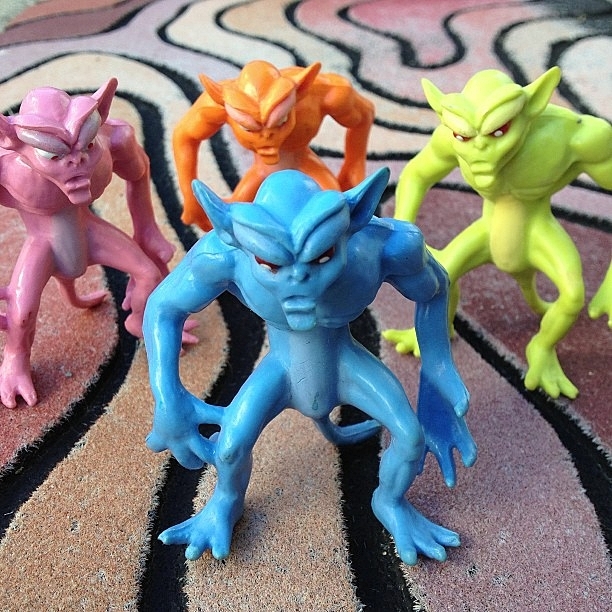 Blackstar companion figures: demon minions! As I mentioned when I wrote about the ghost mini figures that came with Kenner Ghostbusters action figures, often toy accessories can be just as cool--sometimes even cooler--than the main attraction. Some of my other favorite "companion" figures of all time came with Galoob's 1980s Blackstar action figures. If you're not familiar with Blackstar, it was a short-lived cartoon launched in 1981 that's representative of the fantasy craze of the decade, comparable to Masters of the Universe. For a more detailed synopsis, you can check out the series' Wikipedia page. I'm a few years too young to have experienced the show originally, but I have older brothers who happened to have a couple of the Blackstar toys, which were actually released a couple years after the show ceased production, from 1983-1985. One of those toys was the green-yellow demon on the right side of the above photo. Lucky for me, my brothers had stopped caring about their toys by the time I was old enough to play with them, so I was pretty much able to claim this guy for myself along with a lot of other cool stuff. Not only do I like the Blackstar demons because they make me feel instantly nostalgic, I also think it's an excellent sculpt. This guy has a lot of personality. Just look at his face--he looks like a nasty, scheming little bugger. He's the perfect minion. In my childhood I had no idea that the green demon I carried around was a Blackstar toy, or even what Blackstar was. But years later when browsing toys online I not only discovered what series he belonged to, but that he came in more colors. I quickly tracked down pink and orange ones, and just this week finally got a blue one. I think there's also a red variation that I have yet to add to my collection. I also found out that these demon figures came packaged with the line's evil character action figures, while the good characters came packaged with gnome-like "Trobbit" companions. In addition to the original demon sculpt, some of the later figures came packed with different evil companions (which I believe were also referred to as demons, although didn't look anything like the original ones). You can see a couple of those in the photo to the right. In my opinion not quite as cool as the others, but I do like the little green armored cyclops dude quite a bit. 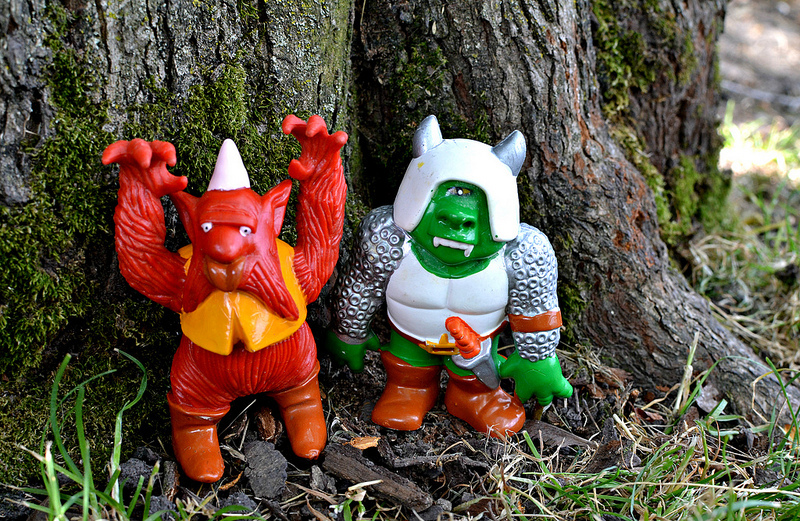 I love the toys that the '80s fantasy craze produced--from Masters of the Universe to Arco's The Other World and Dragons N Monsters to LJN's Dungeons and Dragons--and Blackstar figures, including these companion figures, definitely rank high among my favorites. What do you think of these guys? And what are some of your favorite companion figures? The demons are pretty slick, but I could give or take the others. I'll bet the demon guys go really well next to Mordles, huh? I was always big on the David Arshawsky sculpted companion figures from the TMNT line from the late80's/early 90's. 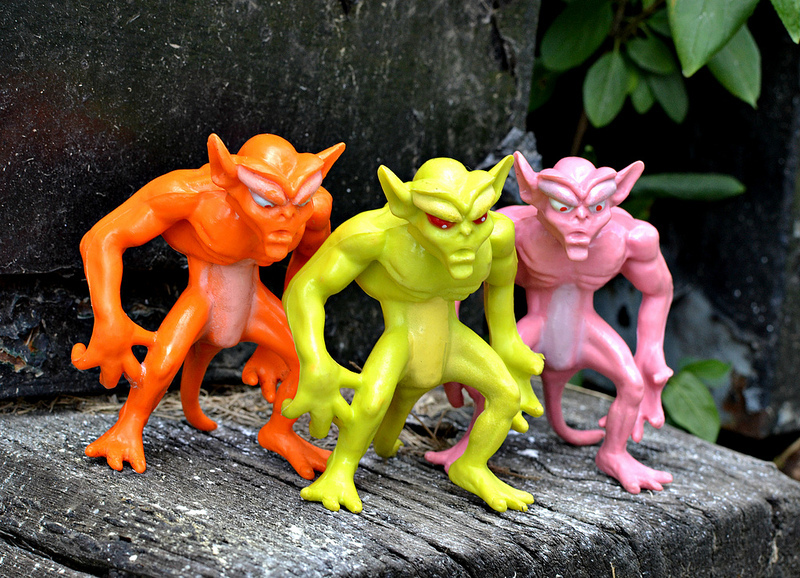 I didn't have a clue who sculpted them when I was a kid, but Screwloose (the little yellow mosquito that came with the batty Wingnut figure) made a strong enough impression on me, that I felt compelled enough to find out who made him. I also have a soft spot for the Ben 10 companion figures that come with the 4" line, notably the Galvan characters. I actually don't have any Mordles, but I am sure they would. The Mordles could be minions of the minions, ha. The TMNT companion figures are pretty great. I don't have all of them but I do have a few. Screwloose is probably my favorite. As for Ben 10, I don't know enough about them to know which ones you're talking about--will have to look them up! I came across a demon of the green variety lately. I had no idea what toy line he was from since he has no markings. I'm surprised to find he is a companion figure, because the sculpt quality is top notch! I guess it's true what you say, sometimes the companion figure outshines the star. Seems like everyone has come across one of these demons at some point even if they didn't know what it was. They're so cool and it's great that they made them in different colors. Hello i was wondering if anyone knew the value of the orange one and the green one. they are both in great condition. I found them in a box along with a lot of other older toys i am trying to find values for. any ideas on where i can look? not knowing who or what they are is proving difficult to find them online. eBay is a good starting point. If you decide to sell let me know, I am looking for the orange demon. Hope that helps!